1The official national language is Norwegian bokmål and nynorsk. Additionally Sami is a co-official language in six municipalities and Finnish in one other. 3Area rank based on UN figure which includes Svalbard and Jan Mayen. Norway is a Nordic country on the western portion of the Scandinavian Peninsula, located in Europe, and bordering Sweden, Finland and Russia. Norway has a very elongated shape; the country's extensive coastline along the North Atlantic Ocean is home to its famous fjords. The Kingdom of Norway also includes the Arctic island territories of Svalbard and Jan Mayen. The Norwegian sovereignty on Svalbard is based on the Svalbard Treaty, but this does not apply to Jan Mayen. Bouvet Island in the South Atlantic Ocean and a claim for Peter I Island in the South Pacific Ocean are also external dependencies, but these are not part of the Kingdom. Norway also claims Queen Maud Land in Antarctica where it has established the Troll permanent research station. Archaeological finds indicate that there were people in Norway about 12,000 years ago. They probably came from more southern regions, that is northern Germany, and travelled further north along the Norwegian coastline. In the 9th century, Norway consisted of a number of petty kingdoms. According to tradition, Harald Fairhair gathered the small kingdoms into one in 872 with the battle of Hafrsfjord. He became the first king of a united Norway. The Viking age (8th to 11th centuries) was one of unification and expansion. The Norwegians established settlements on Iceland, the Faroe Islands, Greenland and parts of Britain and Ireland, and attempted to settle at L'Anse aux Meadows in Newfoundland, Canada (it is the Vinland of the Saga of Eric the Red). Norwegians founded the modern-day Irish cities of Limerick and Waterford and established trading communities near the Celtic settlements of Cork and Dublin which later became Ireland's two most important cities. The spread of Christianity in Norway in this period is in large part attributed to the missionary kings Olav Trygvason ( 995- 1000) and Saint Olav ( 1015- 1028), although Haakon the Good was Norway's first Christian king and the norse tradition was replaced slowly over two centuries (9th and 10th centuries). In 1349, the Black Death wiped out between 40% and 50% of the Norwegian population, causing a decline in both society and economics. During this decline, the Fairhair dynasty died out in 1387. Royal politics at the time resulted in several personal unions between the Nordic countries, eventually bringing the thrones of Norway, Denmark, and Sweden under the control of Queen Margrethe when the country entered into the Kalmar Union with Denmark and Sweden. Sweden declared its independence in 1523, but Norway remained under the Danish crown until 1814. During the national romanticism of the 19th century, this period has sometimes been referred to as the "400-Year Night", since all of the kingdom's royal, intellectual, and administrative power was centred in Copenhagen, Denmark. However, it must be said that the common people of Norway had more freedom than the Danish people because the rural communities of Norway were organised differently than those of Denmark. Other factors also contributed to Norway's decline in this period. With the introduction of Protestantism in 1537, Norway lost the steady stream of pilgrims to the relics of St. Olav at the Nidaros shrine, and with them, much of the contact with cultural and economic life in the rest of Europe. Additionally, Norway saw its land area decrease in the 17th century with the loss of the provinces Bohuslän, Jemtland, and Herjedalen to Sweden, as a result of the wars between Denmark-Norway and Sweden. After Denmark-Norway was attacked by England, it entered into an alliance with Napoleon, and in 1814 found itself on the losing side in the Napoleonic Wars and in dire economic conditions. The Dano-Norwegian Oldenburg king was forced to cede Norway to the king of Sweden. Norway took this opportunity to declare independence, adopted a constitution based on American and French models, and elected the Danish crown prince Christian Fredrik as king on May 17, 1814. However, Sweden militarily forced Norway into a personal union with Sweden, establishing Charles XIII of Sweden as king of Norway (as Carl II). Under this arrangement, Norway kept its liberal constitution and independent institutions, except for the foreign service. See also Norway in 1814. This period also saw the rise of the Norwegian romantic nationalism cultural movement, as Norwegians sought to define and express a distinct national character. The movement covered all branches of culture, including literature ( Henrik Wergeland, Maurits Christopher Hansen, Bjørnstjerne Bjørnson, Peter Christen Asbjørnsen, Jørgen Moe, Henrik Ibsen), painting ( Hans Gude, Adolph Tiedemand), music ( Edvard Grieg), and even language policy, where attempts to define a native written language for Norway led to today's two official written forms for Norwegian; Bokmål and Nynorsk. Peter Christian Hersleb Kjerschow Michelsen (March 15, 1857 – June 29, 1925), a Norwegian shipping magnate and statesman, was Prime Minister of Norway from 1905 to 1907. Michelsen is most known for his central role in the peaceful separation of Norway from Sweden on June 7, 1905, and was one of Norway's most influential politicians of his day. Norway's growing dissatisfaction with the union with Sweden during the late 19th century, combined with National Romanticism and the awakening sense of nationality contributed to the dissolution of the union. After a national referendum confirmed the people's preference for a monarchy over a republic, the Norwegian government offered the throne of Norway to the Danish Prince Carl. Parliament Stortinget unanimously elected him king. He took the name of Haakon VII, after the medieval kings of independent Norway. In 1913, Norwegian women gained suffrage. Norway was a neutral country during World War I. Norway also attempted to claim neutrality during World War II, but was invaded by German forces on April 9, 1940 ( Operation Weserübung). The Allies also had plans to invade Norway, in order to take advantage of her strategically important Atlantic coast, but were thwarted by the German operation. Norway put up a stiff fight against the German occupation and armed resistance in Norway went on for two months. The battle of Vinjesvingen eventually became the last stronghold of Norwegian resistance in southern Norway in May, while the armed forces in the north surrendered in early June. King Haakon and the Norwegian government continued the fight from exile in Rotherhithe, London. On the day of the invasion, the collaborative leader of the small National-Socialist party Nasjonal Samling — Vidkun Quisling — tried to seize power, but was forced by the German occupiers to step aside. Real power was wielded by the leader of the German occupation authority, Reichskommissar Josef Terboven. Quisling, as minister president, later formed a government under German control. During the five years of Nazi occupation, Norwegians built a strong resistance movement which fought the German occupation forces with both armed resistance and civil disobedience. Notable was also the effort of the Norwegian Merchant Navy. At the time of the invasion Norway had the third largest, fastest and the most effective Merchant Navy in the world. It was lead by the Norwegian shipping company Nortraship under the allied force throughout the war and took part in every war operation from the evacuation of Dunkirk to the Normandy landings. Following the war the Social Democrats came to power and ruled the country for much of the cold war. Norway joined the NATO and became a close ally of the United States. Two plebicites to join the European Union failed by a narrow margin. Norway is a rugged and mountainous country, containing a great variety of natural features caused by prehistoric glaciers. The most noticeable of these are the fjords, deep grooves cut into the land that flooded with water. The largest of these is Sognefjorden. Norway also contains many glaciers and waterfalls. The Royal House is a branch of the princely family of Glücksburg, originally from Schleswig-Holstein in Germany. As it stands, however, the functions of the King, Harald V, are mainly ceremonial, but he has influence as the symbol of national unity. Although the constitution of 1814 grants important executive powers to the King, these are almost always exercised by the Council of State in the name of the King (King's Council, or cabinet). The reserve powers vested in the Monarch by the constitution are significant and an important security part of the role of the Monarchy, and were last used during World War II. The Council of State consists of a Prime Minister and his council, formally appointed by the King. Parliamentarism has evolved since 1884 and entails that the cabinet must not have the parliament against it, and that the appointment by the King is a formality. 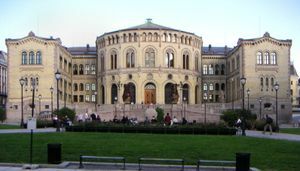 The Norwegian parliament, Stortinget, currently has 169 members (increased from 165, effective from the elections of 12 September 2005). The members are elected from the 19 counties for 4-year terms according to a system of proportional representation. The Storting divides itself into two chambers, the Odelsting and the Lagting when voting on legislation. Laws are proposed by the government through a Member of the Council of State or by a member of the Odelsting and decided on by the Odelsting and Lagting, in case of repeated disagreement by the joint Storting. However, in modern time the Lagting rarely disagrees and mainly just rubber-stamps the Odelsting's decision. Before the present Storting is a proposed constitutional amendment which would repeal the division. Impeachment cases are very rare (the last being held in 1927 when prime minister Abraham Berge was acquitted) and may be brought against Members of the Council of State, or of the Supreme Court or of the Storting, for criminal offences which they may have committed in their official capacity. Indictments are raised by the Odelsting and judged by the Lagting and the Supreme Court justices as part of the High Court of the Realm. Apart from this, the Storting functions as a unicameral parliament. The regular courts include the Supreme Court or Høyesterett (18 permanent judges and a chief justice), courts of appeal, city and district courts, and conciliation councils. Judges attached to regular courts are appointed by the King in council after nomination by the Ministry of Justice. The special High Court of the Realm, which consists of the Supreme Court plus the Lagting, hears impeachment cases. In order to form a government, more than half (currently at least 10 out of 19 members) of the Council of State are required to belong to the Church of Norway. Freedom of expression is enshrined in paragraph 100, Freedom of religion in paragraph 2 of the Constitution of Norway, though many consider this compromised in practice by the establishment of a state church. The press is not censored, but most editors adhere to self-imposed commandments of caution (" Vær Varsom-plakaten"). Public radio and TV broadcast mostly without interference from the government, although permission to broadcast depends on the programme spectrum. The constitution forbids retroactive laws, punishment not based on laws and court decisions, and the use of torture. In 1999 the Human Right conventions of the United Nations and the Council of Europe were constituted as law in Norway, Menneskerettsloven. However, Norwegian Lawyers as well as the Council of Europe's Committee Against Torture have expressed their concern about unwarranted imprisonment of criminal defendants and the use of solitary confinement in Norway, deeming it torture. Also the treatment of refugees has been under discussion. In 2005 the international conventions against discrimination of women and race discrimination were incorporated in, but not superior to, Norwegian law. Amnesty International has recently focused on violence against women in Norway and shortage of public services to victims of violence. Norway has mandatory military service of 9-12 months for men between the ages of 18 (17 with parental consent) and 44. Conscientious objectors serve 12 months in an alternative civilian national service. If a candidate refuses to attend the assessment of fitness ("sesjon"), where any objections to future military service is to be brought up, they are liable to prosecution. A person who is deemed fit for service and who is not a conscientious objector, but still refuses military service is also liable to prosecution. However, recent changes to the structure of the armed forces has resulted in less demand for soldiers, and hence the number of soldiers actually having to attend military service is decreasing. Homosexuality was officially decriminalized in 1972; homosexual partnerships in 1993. According to Statistisk sentralbyrå (SSB) there were 192 homosexual partnerships recorded in 2004. Since 2002 it has become possible for homosexual partners to adopt each other's children from previous relationships, although joint adoption is still not allowed. Norway is the current top-ranked nation in the UN Human Development Index. 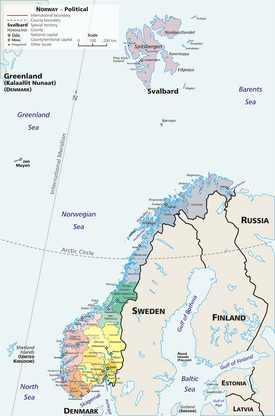 Norway is divided into 19 administrative regions, called fylker (singular fylke) and 431 kommuner (singular kommune). Fylke and kommune are officially translated to English as county and municipality. The fylke is the intermediate administration between state and municipality. Note: The 19 fylker might be replaced with 5 - 9 larger regions by 2010. See also Regions of Norway. Norway possesses the second highest GDP per capita in the world, and the highest position in the World on the Human Development Index (HDI) for the fifth consecutive year. The Norwegian economy is an example of mixed economy, featuring a combination of free market activity and government intervention. The government controls key areas, such as the vital petroleum sector and the electricity production. The control mechanisms over the petroleum resources is a combination of state ownership in major operators in the Norwegian fields ( Statoil ca 70% in 2005, Norsk Hydro 43% in 2004) while specific taxes on oil-profits for all operators are set to 78%, finally the government controls licensing of exploration and production of fields. The country is richly endowed with natural resources: petroleum, hydropower, fish, forests, and minerals. Norway has obtained one of the highest standards of living in the world, partly from petroleum production but mainly from efficient economic policies, creating a good environment for doing business. Norway has a very high employment ratio. Norway opted to stay out of the European Union during a referendum in 1972, and again in November 1994. However, Norway, together with Iceland and Liechtenstein, participates in the European Union's single market via the European Economic Area (EEA) agreement. The EEA Treaty, between the European Union countries and the EFTA countries, transposed into Norwegian law via "EØS-loven" , states the procedures for implementing European Union rules in Norway and the other EFTA countries. This makes Norway a highly integrated member of most sectors of the EU internal market. However, some sectors (e.g. agriculture, oil and fish) are not covered wholly by the EEA Treaty. Norway has also acceded to the Schengen Agreement and several other intergovernmental agreements between the EU member states. In 2000 the government sold one-third of the then 100% state-owned oil company Statoil in an IPO. The next year, the main telecom supplier, Telenor, was listed on Oslo Stock Exchange. The state also owns significant shares of Norway's biggest bank, DnB Nor and the airliner SAS. The economic growth has been rapid recently, pushing unemployment down to levels not seen since the early 1980s. Animal rights and anti- whaling groups have commented that given Norway's economic position it is paradoxical that this is one of a very small number of countries actively engaged in, and favouring the continuation of, commercial whaling. This is despite the argued negligible contribution that whaling makes to the economy, and despite opposition from around the world ( ). Many supporters of whaling agree that its macroeconomic importance is negligible, but hold that the livelihood of individuals and small firms depend on it and that sustainable development depends on human harvesting of all non- endangered species ( ), and that it is an important part of culture in coastal areas. Norway's whaling today is limited to the non-endangered Minke Whale, which are killed using explosive grenade harpoons, which also accounts for more than 90% of the catch in Norwegian waters since the 1920s ( ). 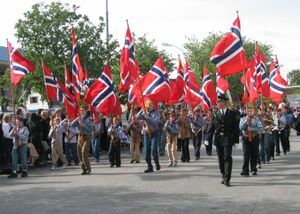 The size of the Norwegian population is around 4.6 million and is increasing by 0.4% per year (estimate July 2004). Ethnically most Norwegians are Nordic / North Germanic, while small minorities in the north are Sami or Finnish (see also Kven). The Sami are considered an indigenous people and traditionally live in the central and northern parts of Norway and Sweden, as well as in northern Finland and in Russia on the Kola Peninsula. The largest concentration of Sami people is, however, found in Norway's capital Oslo. In recent years, immigration has accounted for more than half the population growth, and 7.9% of the population are immigrants as of 1 January 2005. The largest immigrant groups are Pakistanis, Swedes, Danes, Iraqis, Vietnamese and Somalis. (Here, immigrants are defined as persons with two foreign-born parents .) At the beginning of 2006, there were 387 000 persons in Norway with immigrant background, referring to 8.3 per cent of the total population. The Iraqi immigrant population has showed a large increase over the last years, and now it is the third largest immigrant group in Norway after Pakistanis and Swedes. 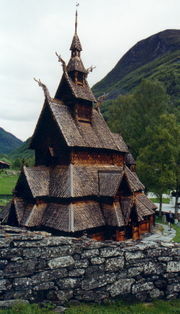 Approximately 86% of Norway's inhabitants are members of the state church, the Evangelic Lutheran Church of Norway. However, baptism has a strong tradition in Norway, and since many people never bother to manually withdraw their membership, this number does probably not reflect the actual faith of the inhabitants. Moreover, many Norwegians have found themselves being members even after manually withdrawing their membership, and there are indications that at least previously all newborn Norwegians were automatically registered as members of the state church, not only the baptised ones. Other Christian denominations total about 4.5% (the Evangelical Lutheran Free Church, the Roman Catholic Church, Pentecostal congregations, the Methodist Church, etc). Among other religions, Islam is the largest in Norway with around 1.5%, and other religions comprise less than 1% each, (including Judaism; see Jews in Norway). Around 1.5% adhere to the secular Human Ethical Union. As of 1 January 2003 approximately 5% of the population are unaffiliated ( ). Norwegian literature is very rich, covering a period since early 9th century. The earliest preserved examples of Old Norse literature are the Eddic poems.